The days since we left Antigua have been intense and it’s going to be hard for me to focus on the key events so bear with me. We usually attempt to focus our blogs on a collection of days that are related but the past week has been a total hodge podg of experiences. Also, my brain has been hyper-focused on trip related issues so I don’t have very many photos from the past few days. After Antigua we cruised south to a small town closer to the border called Chiquimulila. We stayed one night there before hitting the road for the El Salvador border, however I was not mentally prepared to deal with the ‘fixers’. In our previous border crossings people haven’t been annoyingly persistent in their attempts to solicit us and it lulled me into believing all people would be so agreeable. As we approached the El Salvadorian border we saw the first of the trucks. Central American countries have few crossings where the semis can get through and the line of rumbling smoking beasts can stretch for miles leading up to a border. As a motorcyclist or regular car you should just go around them if there is space. They aren’t dealing with the same officials or paperwork as tourists so you aren’t ‘cutting’ anybody. As we approached the first trucks we swung ourselves into the opposite lane and kept going as a collection of guys with scooters tried to flag us down near the end of the line. Four men on two scooters then proceeded to follow us weaving in and out of the trucks and trying to motion us through the trucks for the next several miles (see video). It can get pretty overwhelming to be honest and as Nathaniel and I arrived to the custom office and began parking I totally lost my temper and screamed at them. I’m not fluent enough in Spanish for cursing to happen as an accident (I did not curse at them), but I definitely didn’t plan to yell at them. I DON’T NEED YOUR HELP. LEAVE ME ALONE. One of them men jumped backwards and seemed really surprised at my outburst while his partner trailed us for another 10 minutes before finally giving up. Without any hiccups the crossing took about two hours. It was mostly boring and hot, though not very difficult, although I sometimes get mentally tired constantly dealing with official documents in Spanish. Something very important about crossing borders with a vehicle in Latin America is that you need originals of your passport, drivers license, title, registration and several copies of all of them before you even think about visiting Aduana (customs). We left the border and made for Sunzal El Salvador. The coastal road to get there was equal to many sections of Highway 1 in California and we found a place to stay a few hundred feet from the beach for $20 a night, we have now driven from the Pacific Ocean to the Caribbean and back! We only arrived about an hour before sundown so I asked Nathaniel if we could crash for two nights in Sunzal as the idea of two border crossings in two days (we were on a mission to get to Honduras) made my head hurt. 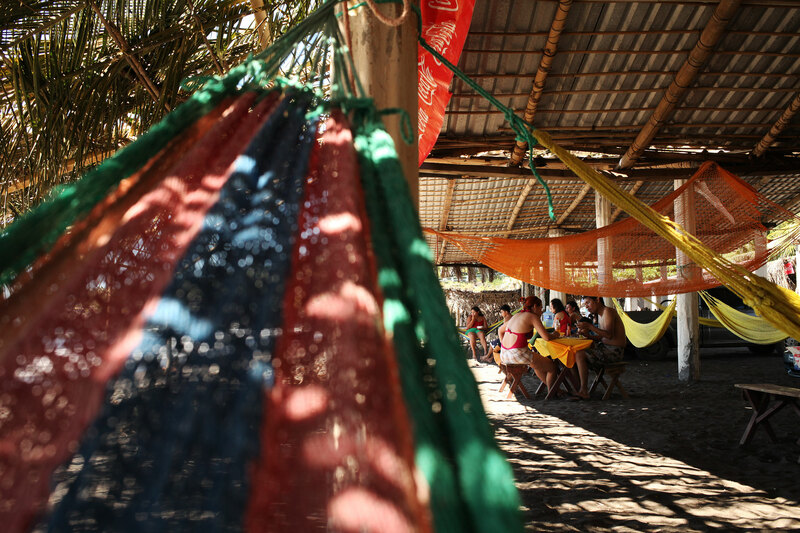 We spent a very lazy day in Sunzal eating fish papusas, Nathaniel swimming in the ocean (he is Aquaman), and laying on hammocks before getting up early and heading out for the next border. 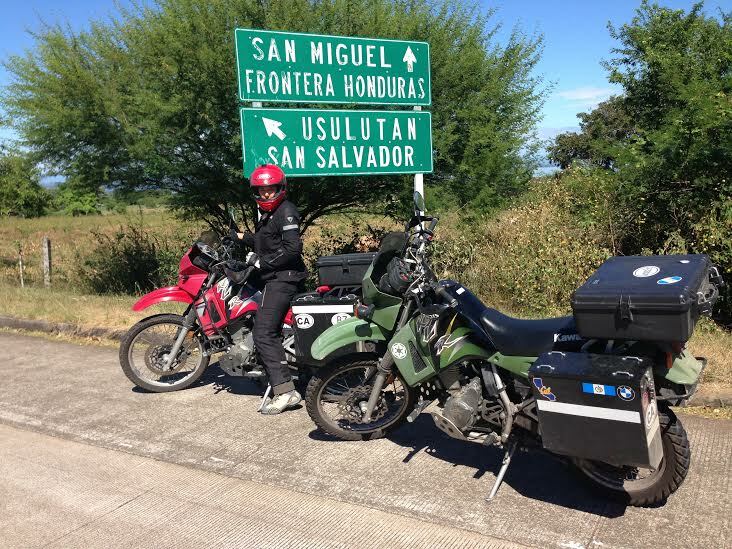 Because of some ATM issues (sometimes finding money in Latin America can be difficult when your off the beaten path) we couldn’t cross the border December 2nd as intended and had to stay in a border town called Santa Rosa de Lima. After checking out a few hotel options at the end of a hot day we were just ready to take anything and followed a sign for a ‘Auto Hotel’. When we arrived we were so excited to see that each room had its own enclosed garage below it. Perfect! 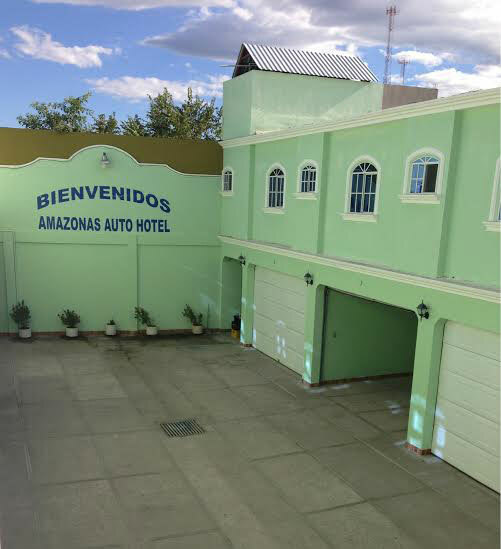 I asked the man how much per night and was okay with the $35 price tag because it meant our bikes would be totally safe for the night as there weren’t any real other viable options in this border town. Once we went up to our room we realized we had accidentally booked ourselves into an infamous ‘Love Hotel‘. A Love Hotel is basically a place where you can pull your car into a garage, close the door, pay for the room (3 hour minimum) and leave all without ever talking to someone face to face. You pay in cash and they don’t ask for your name. The room was actually really clean (cleaner than most), but had some very bizarre features that a regular hotel would never have. For starters – they pipe in music and although you can control the volume you can’t quite turn it off. Secondly high up of the wall was an automated air freshener that sprayed the room with sickly flower smell every 15 minutes. The entire situation was comical but the hotel its self was secure and clean which is why we were able to push the ick-factor out of our minds and hunkerdown with cheeseburgers and an CSI marathon for the night. On CSI commercial breaks I would occasionally go to the window to keep track of the hotel’s turnover rate by counting closed garage doors. Once again the next morning we zipped up our riding suits (still giggling about the hotel) and put our sights on the next border. For the El Salvador – Honduras border we had our game faces on. It’s supposed to be the most grueling Kafkaesque border crossing in all of Central America. We knew it could take a few hours, but we had to be prepared for it to take all day. We checked multiple sources for information on what we needed before crossing and we found a BRILLIANT post on RideDot (Link) that had a step by step breakdown of the process. I’m not going to talk to you. I speak Spanish. I don’t need your help. And they left us alone pretty quickly. I hate being rude to people, but I had learned the crossing before that a hundred ‘no thank yous’ won’t go as far as one very direct and angry message. Getting out of El Salvador was easier and faster than navigating BART from SF to the East Bay and the Aduana Official of Honduras was an angel. I don’t think I’ve met a nicer or more friendly government employee in any country. The most unpleasant part was the giant line at the immigration office on the Honduran side, but by then the light at the end of the tunnel was glorious and bright. We are now in the Honduran capitol of Tegucigalpa and plan on leaving for Leon Nicaragua in a few days. Thank you for sticking with me through this post – I know it was a little all over the place. Prepare yourself for Nicaragua. If you think the fixers were bad in Salvador and Honduras brace yourself. I will never forget my trip to Nicaragua with a group of friends. When we arrived at the bus terminal there were 25 to 35 taxi men all wanting to help. After an hour of waiting in the terminal for them to leave, but they never did, I went outside and asked what part of no they didn’t understand. By the way I speak Spanish fluently, so finally after raising my voice and asking what was wrong with them, one guy replied. Well we are not like you guys. We are not so civilized. He says, We are (in spanish) “casi como canibales”. And then as soon as the conversation finished he started crazily yepping away asking if we needed a taxi. I agree, they were not civilized. We were a group of 6 guys and traded off with a few guys constantly watching our backs as we walked the streets. Then again it might only be like that at the bus terminal. I don’t remember the details of the border crossing so it must not have been that extreme. Yeah we try to take every border crossing as it comes so as not to get overwhelmed by it all. Also we try to stay out of the larger cities when we can because in all countries they tend to be more aggressive then country towns. Thanks again for the contacts in Guatemala and the work on the bikes! AAH. Such an amazing journey so full of great experiences and challenges. I am enormously proud of you both and so look forward daily to any of your photos and posts. Be well, safe and enjoy. Wow! You’re so brave and smart. I really enjoy your posts, your journey is one of a kind. You be safe, be careful, have fun! Say hi to Nathaniel, too. wowwwww….you two are brave and daring…i wish you luck and a safe journey..